White fan blenders. 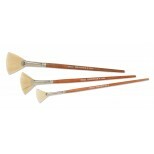 Fine quality white bristle fan blending brush firmly set in seamless nickel plated ferrules. Stained hardwood artist shaped handles. Use for wet - on - wet blending, highlighting and dry brushing effects. 05223 4 Hair Out is 3/4", Length is 1 3/8" 1 3/8"
05224 6 Hair Out is 1", Length is 1 3/4" 1 3/4"